Next to take the podium was Rosemary Low, the well-known prolific writer on all things parrot, and regular speaker at conferences and meetings around the world. Her subject was “Parrot conservation in situ: a worldwide overview”, and this must have been one of the best presentations I have seen her give. Rosemary took us on a whistle-stop tour of the world in 45 minutes, illustrating various conservation projects with many parrot species. Some are proving successful, others less so. Rosemary started by saying that parrots are the most endangered group of birds in the world, with 28% of nearly 400 species threatened, and 56% in decline. Most of this is the result of habitat loss and trapping of parrots, with the Far Eastern countries, South America, and Australia being worst affected. Conservation projects in general involve four techniques. The first is education of the local population (often targeting schools) about the value of their native birds and the plight they face. The second is preservation of the native habitat where possible, or planting of natural vegetation to regenerate damaged areas. This is difficult in many places, since conservationists are up against huge industrial conglomerates, hostile governments, or local people trying to scratch a subsistence living by growing crops to feed their families. Planting ‘green corridors’ to link isolated areas of remaining normal habitat can aid the movement of birds and animals that are otherwise cut off. Such projects take considerable time and money. So thirdly, there is general funding, to assist research in the field, education and planting projects as outlined, wardens to supervise the ongoing protection of such areas, food replacement schemes, and the fourth category of providing artificial nest boxes. The latter was perfectly illustrated in the video from Ray Ackroyd, which opened the seminar. Most parrot species nest in trees – either in branches, or more commonly in hollow cavities within the trunk. These require mature trees, and where deforestation for logging or agriculture has occurred, these are in short supply, and take many years to replace naturally. Rosemary illustrated various techniques, including wooden, metal, or plastic nest boxes mounted on smaller trees or artificial poles, or the deliberate creation of hollow cavities in branches large enough to take them. Rosemary commented that many of the larger groups involved in such projects, like the World Parrot Trust, the Loro Parque Foundation, and Birdlife International were well known, but that there were many smaller, less recognised local groups doing sterling work with little publicity. She started her world tour in Australasia, citing first the Carnaby’s Cockatoo, which has lost 93% of its native habitat to government-sanctioned clearance for agriculture, timber and mining. The situation has been exacerbated in many areas by prolonged drought and fires. She said that written information on many of these birds is well out of date, as the situation is worsening so rapidly. This is particularly true of the Western (Stanley) Rosella, which is legally shot as a crop pest. The Barraband’s Parakeet has lost 75% of its original habitat, and whilst tree planting is taking place, it can take 100 years for suitable nest hollows to appear, so this is where some of the artificial hollowing is being done. Neophema species tend to nest in open-topped stumps, and these are also in short supply. The Black Palm Cockatoo has lost 85% of its native habitat, much of that to bauxite mining. And so the depressing list went on. Rosemary mentioned other important factors such as the discouraging of bees, snakes and other reptiles or small mammals from using nest holes, and the elimination of predators (many introduced and not native) such as cats and rats. Techniques used for the Kiwi of eliminating these predators from off-shore islands, or contained areas, and then releasing captive-bred birds into such areas have been adopted for the Red-fronted Kakariki. Radio tracking of such birds has helped to monitor the success or otherwise of such projects, and has been made easier by modern improvements in smaller size and longer battery life of such trackers. Our speaker then took us on a jump back to India, where she said that very few conservation projects existed, and there was little general ornithological interest. It has been illegal to catch wild parrots here since 1990, but this is not enforced, and 8 of the 12 native species of parrots are still regularly taken. 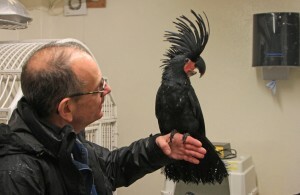 Rescue Centres for Alexandrine and Derbyan Parakeets exist, but there are no Rehabilitation efforts. The situation is little better in Indonesia, which Thomas Arndt has described as being “20 years behind Brazil in parrot conservation”. Again, most of the problem is the result of heavy deforestation and illegal trapping. Better news came from Central and South America, with Rosemary citing the example of the Yellow-eared parrot in Colombia, where numbers have risen from 100 to 4,000 in 16 years. There is considerable enthusiasm for educational projects involving schoolchildren, to tackle the problem at source. The fantastic importance of eco-tourism for bird conservation has been realised in many places, and the clay licks where parrots gather in their scores are very popular. However, in Peru, illegal trapping and the loss of nest sites by felling trees to collect fledgling birds is still a big problem. Of the 31 species of Amazon parrot recognised by CITES, 13 are listed on Appendix 1. Once again, most of the problem results from habitat loss and over-trapping. In 1980, 20,000 Tucuman Amazon parrots were exported! The Atlantic rainforest in particular has suffered from deforestation as the human population expands rapidly. Also here, techniques such as education, predator control, the provision of nest boxes, and the moving of parrots to ‘safe’ estuarine islands has been working for species like Amazona brasiliensis. The highly popular (in aviculture) Pyrrhura species of small conures/parakeets have suffered from the loss of native trees supplying food and nest sites. However, these endearing birds take very well to artificial nest boxes, and one such project for the Grey-breasted Parakeet and supported by The Parrot Society was illustrated in Steve Brookes’ later presentation. Rosemary mentioned the ‘barrier effect’ of high mountains and deep valleys, and once more emphasised the importance of planting green corridors to link isolated patches of natural habitat for these birds. These allow the intermingling of separate populations, thereby countering the risk of genetic impoverishment associated with in-breeding. We were then taken north to Mexico, and we heard that the numbers of Double Yellow-headed Amazon parrot have plummeted by 90% since 1970. 70% of this loss is due to habitat destruction, while the balance is from illegal trapping and smuggling. Amazona finschii has just 2% of its original habitat left! Strong, active campaigning has led to laws being passed in 2008 to stop trapping, and there have been many educational posters and books produced to highlight the plight of these birds in Mexico. Finally, Rosemary took us across the Atlantic Ocean to Africa, where she said that it is common practice for hunters to poison water in drinking pools in arid areas, in order to catch game and birds to eat. Many other avian species are persecuted as crop pests. Once again, park rangers have been employed to police such areas, while many educational projects have been established to stimulate and garner the interest of schoolchildren. 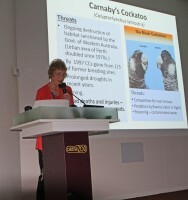 Rosemary Low concluded her illuminating presentation with the good news that in October 2016 the popular African Grey Parrot (Psittacus erithacus) and the Timneh Grey (Psittacus erithacus timneh) would be upgraded to CITES Appendix 1, thereby making all capture and trade in these now endangered species illegal without special permit. After a fascinating morning of excellent presentations, with a lot of important information to absorb, delegates then adjourned for a light lunch, and a chat with friends and colleagues in the welcome autumn sunshine, before reconvening for the afternoon session. Delegates enjoying a well-earned lunch break in the sunshine! After lunch, Eric Peake re-convened the delegates, and introduced Steve Brookes to begin the afternoon session. Steve is a traveller, photographer, and parrot enthusiast, who organises trips for small groups of parrot lovers to south and central America, via his company Wild Parrots Up Close. 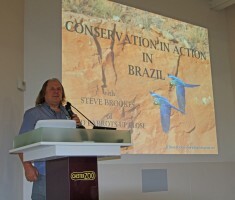 His presentation, entitled ‘Conservation in Action’ described a visit to north-east Brazil in May 2016, to visit three conservation projects that were funded (wholly or in part) by the Parrot Society UK. Two of these involved the Lear’s Macaw, (Anodorhyncus learii) and the third the Grey-breasted Parakeet (or Conure) (Pyrrhura griseipectus). Steve began by describing the differences between the Lear’s Macaw and its more familiar (and less endangered) cousin, the Hyacinthine Macaw. The first project described was a land preservation scheme to save one of the largest roosting and breeding sites of Lear’s Macaws from poachers and goats. Based around Canudos Lodge, this has involved the drilling of an artesian well to provide water for planting; fencing to keep out marauding goats; the training of rangers to prevent poaching; and informative signage around the area. Steve described the pre-dawn visit to a roost site, and showed a video clip of the spine-tingling awakening of these macaws, calling as they flew across the lightening sky, gathering into larger and larger groups, before flying off to their feeding grounds. Pairs of birds flew back to the valley later to their nest holes in the sandstone cliffs, where the last few chicks of the season were almost ready to leave their nests and join the adults. Protecting this area of land has also enabled other species to succeed, including Blue-crowned Conures, Cactus Conures, and Blue-winged Parrotlets. The second project focused on food for these macaws and the subsistence farmers whose crops they raided. The favoured food of Lear’s Macaws is Licuri Palm nuts, but many such trees have been cleared for farmland, so the parrots have taken to eating the corncobs (maize) grown by the farmers. Since 2007, 5,200 sacks of corn have been given out to farmers whose crops have been ravaged by the birds. Each farm is assessed for the degree of loss, and the corn sacks are provided by way of compensation, supported by donations from groups such as the PSUK. Farmers are then less inclined to shoot the parrots as pests. Steve informed us that in the 1980s there were thought to be as few as 60 Lear’s Macaws left in this area, but that number had risen to 1400 by 2014. Longer-term management of the problem centres on growing Licuri Palms in secure plantations, to provide the birds with their natural food source. 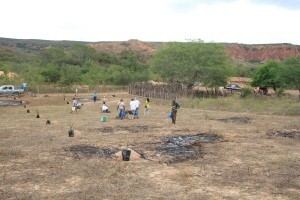 To this end, and to mark its 50th anniversary, the PSUK had arranged to plant 50 young palm trees, in an area that had been cleared and fenced off against goats and cattle. The area was remote, involving a drive of over an hour in 4x4 vehicles along rough sandy tracks, but the representative party from the Society successfully planted the 50 palms, and saw Lear’s Macaws to boot! Finally, Steve told us about the Aquasis project to support the Grey-breasted Parakeets, again involving habitat protection, but also the provision of artificial nest boxes and education. The group had built a visitor centre, using recycled materials, giving tourists and local people information about these birds, and selling souvenirs to help fund the project. 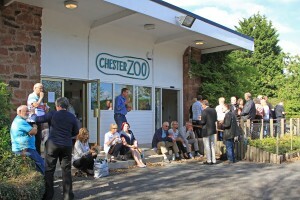 The centre had attracted 6000 visitors so far in 2016. Natural nest holes in trees were disappearing, due to habitat destruction, so many artificial boxes were deployed in safe, protected, private grounds. The PSUK had funded the purchase of a motorbike to make access to some of these remote sites easier. Boxes have to be inspected regularly to remove unwanted occupants such as snakes, possums, bees and bats, while eggs laid and chicks reared are counted. Since 2010, 450 parakeet chicks have successfully fledged from these artificial boxes. The group was rewarded by visits to some of these private sites, and saw families of parakeets gathering to roost in their boxes. An excellent first-hand summary of how dedicated workers, financially supported by groups such as the PSUK, can achieve some remarkable results.